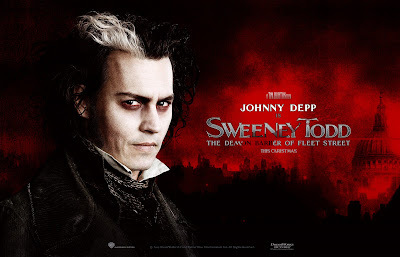 Terry Chan Photography: Movie Review: "Sweeny Todd"
After leaving the Ritz Carlton (Pasadena), which by the way soon to be the Langham Hotel, Lan and I decided to go watch "Sweeny Todd". I'm a sucka for musicals and I remember when I was a young pup in NYC, I wanted to go watch the Broadway version of this movie. I was vastly intriqued with a demon barber cutting up people and then to dispose of these which he deemd evil people to his friend and accomplice to make shepherd pies. What a gruesome concept! Unfortunately, I was too young to go by myself, and none of my friends back then care to watch a Broadway musical. So, 3 decades later, I didn't want to miss this opportunity and wait for the DVD/Blu-ray version. Lan is a great sport. Despite her lack of interest to musicals and distaste for bloody horror flicks, she agreed to accompany me. The storyline is great, but no surprise to me since I already know the storyline years in advance. However, the performance by Johnny Depp, both acting and singing, far surpass my expectations. Not to mention, Helena Bonham Carter's portrayal of Mrs. Lovett was superb... she has a beautiful voice as well. This is Johnny Depp's best performance showing all his talents in one single movie performance. I would be surprised if he doesn't get a nomination for an Oscar in Feb 2008. We gave it a big 2 thumbs up. Don't miss this movie! And if you did, make sure you at least rent the movie in the coming months.